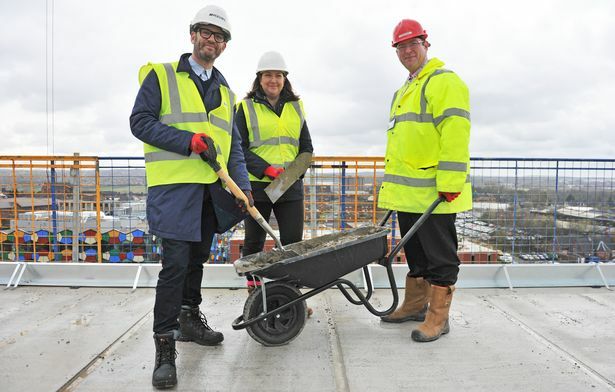 Councillors and Genr8 Developments gathered recently to commemorate Smithfield’s Clayworks apartments topping out. The build-to-rent apartments are officially at their highest point, and the shell of the building will now start to take shape. 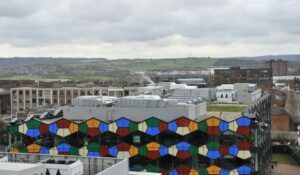 Councillor Randy Conteh, the council’s cabinet member for housing, communities and safer city, added: “We have huge aspirations for housing in Stoke-on-Trent, and to make this city a place where people actively choose to live and work. It was revealed earlier this year that the apartments are to be called Clayworks, after the brand identity being created by brand and placemaking agency D.S.Emotion. At the time, the project team described their ambition “to provide the platform for a previously unavailable homestyle for Stoke-on-Trent, embracing all that is good about the revolution in living patterns”. The build-to-rent concept is being brought to Stoke-on-Trent for the first time by Genr8 and Fortior Homes – a private housing company established by Stoke-on-Trent City Council to deliver high-quality homes that address identified gaps in the private sector housing market. The apartments will be managed by LIV Group, a residential managing agent which specialises in the build-to-let market. Pochin’s, the lead contractor on the scheme, also recently revealed that since commencing works in February 2018, more than £9m has been spent by the construction company with local businesses and subcontractors – across both the apartments and the hotel elements of the project.